Eugene Safe Spot is on Roosevelt Blvd. 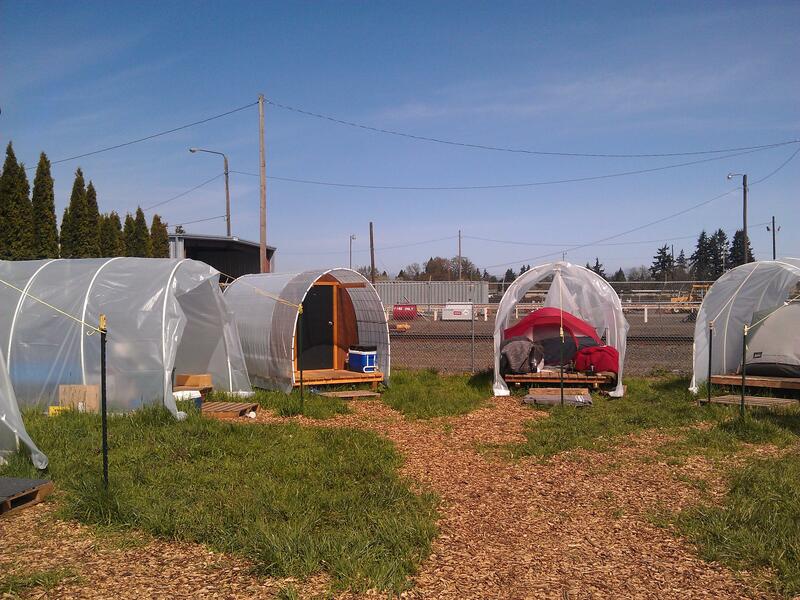 Earlier this month police broke up a high profile homeless camp in Eugene called Whoville. The people who lived there said they felt safe and part of a community. The city has established a pilot program for legal camping. They're called"rest stops". So far there are two. They're creating community for people who need a sense of connection. de Buhr: "…how are things going?" Erik de Buhr of Community Supported Shelters takes me to the *newest rest-stop-- which has been operating for about three weeks. It's on a grassy area between the Northwest Expressway and the railroad. The small plot is surrounded by a metal fence. A few pine trees form a shield from the road. de Buhr: "We paid extra attention to this camp. We really wanted it to blend in as much as possible." About a dozen tents are arranged a semicircle. Most of them have a military look, with camouflage patterned flies. The rest stop for vets features military tents. Siever: "Basically, It's a rest stop for vets." Ron "Squirrel" Siever, 57, is a gatekeeper here. He monitors the entrance. Siever says he's lived in Eugene off and on for most of his life. He calls himself an urban nomad. Siever served in as an army medic at the end of the Vietnam war. He says there's something comforting about living amongst other veterans. Siever: "It's really neat here because the biggest thing is we're all vets so we can relate. Where if it was other people, I think, they wouldn’t understand. And most of the vets here are either going to school, some of them are working. They're waiting on other benefits to come in." 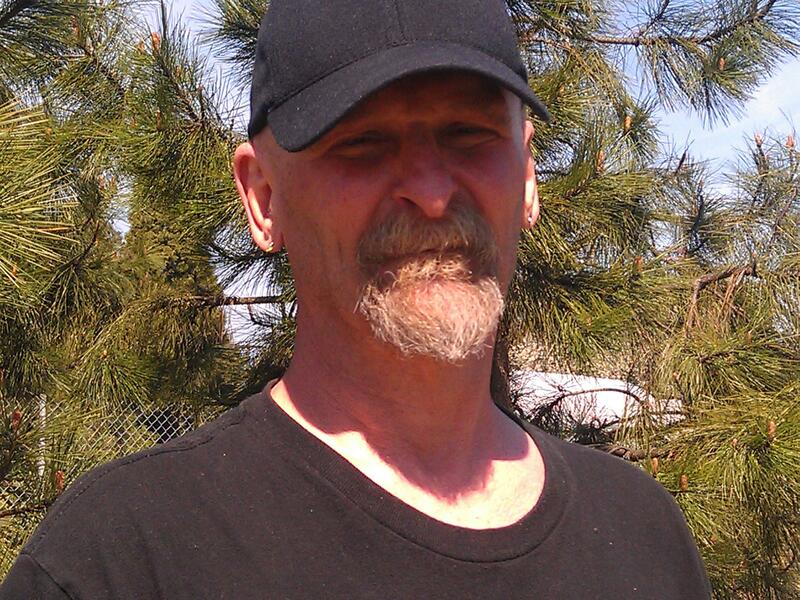 Siever lost his veterans benefits recently because of what he describes as an old arrest. He's trying to get them back. Ron "Squirrel" Siever lives at the new rest stop for veterans. Community Supported Shelters operates another Rest-stop nearby. It's on Roosevelt Street. 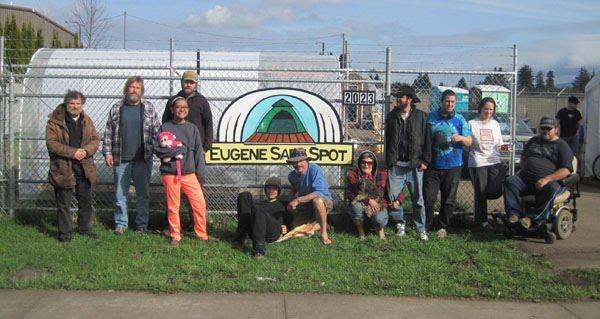 Eugene Safe Spot has been operating for several months. It's the first camp sanctioned by the city. Here, a man who goes by Praise, is site manager. For a while he was camping in the south hills of Eugene, which he describes as warmer and quieter. But he jumped at the chance to live at this rest stop. Praise: "You know I'm in a hut right by Roosevelt Boulevard but there isn’t anything I'd rather be doing right now. I feel extremely blessed to be here and honored to be living with the group of people who are here right now." It's a group of about 15 people. Sherri Newman and her husband moved in after camping illegally nearby. Newman says she has dealt with anxiety for much of her life. Feeling safe is important. 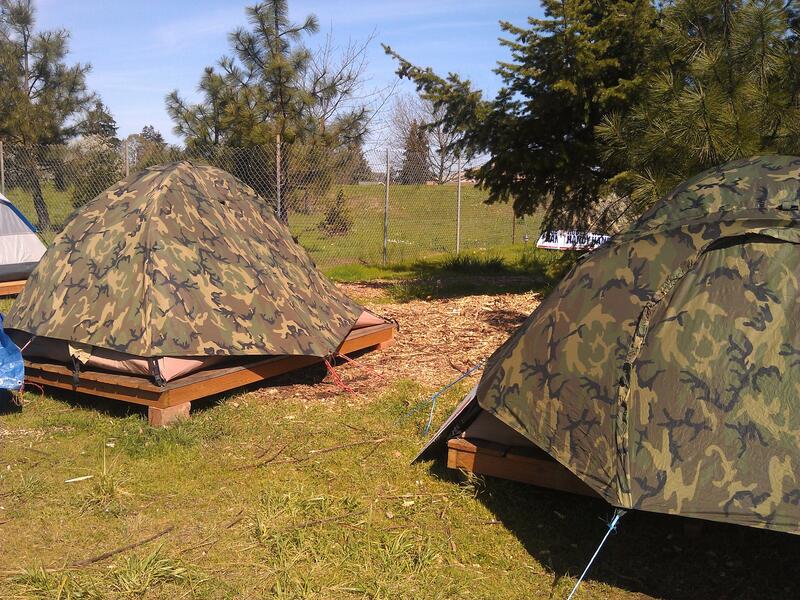 At Eugene Safe Spot tents are on platforms and covered by roofs. Newman: "We were camped out under a bridge and it was a precarious situation. We knew that we could be, go to jail, or whatever they do to you. It was not too safe, anybody could have walked up on us. We were very nervous but you have to have a place to sleep, you know." This is more than a place to sleep though. Erik de Buhr of Community Supported Shelters says people are expected to take responsibility. De Buhr: "We don't just give them a place to stay. We hold them accountable to things. And that's not something that you're going to get if you're sleeping illegally." There's no drinking or drug use allowed here. Residents need to keep their living area neat. de Buhr says residents meet weekly to talk about issues. Erik de Buhr is with Community Supported Shelters. De Buhr: "We're trying to help individuals express their emotions, maybe what they're going through in a constructive way rather then in ways that build up and have an explosion. If we can help people with that one thing alone, it's very valuable for people being successful in their life." Each resident's tent is elevated on a platform built from donated wood. The tents here are also covered with a domed roof. Site managers get to live in Conestoga huts-- micro-houses that were built by community volunteers. The rest-stops are not costing the city money. de Buhr's organization runs off donations. The only monthly expense is for port-a-potties. People bring food and other donations to the camp. de Buhr: "Chipping away at our challenges right now. Even if its one person at a time, it's something. And now, now for us, even if it's 15 people at a time, it's something. So if we keep this momentum going, we're making really good progress." de Buhr acknowledges this particular model isn't for everyone. Some of the people who lived at Whoville might not feel comfortable here. But the city is trying to find another place for a rest stop to accommodate people who were ousted from Whoville. Site Manager Praise gives props to the efforts by the community and city leaders. 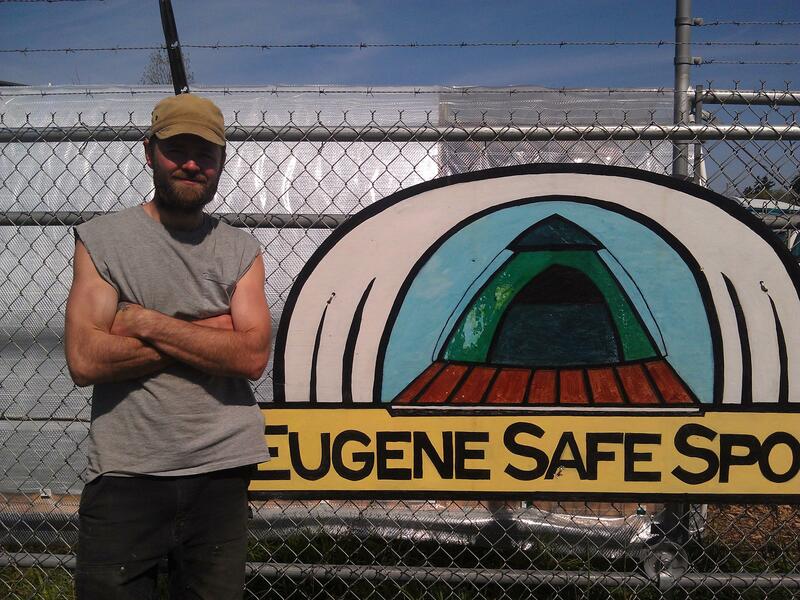 Praise is a site manager at Eugene Safe Spot. Praise: "There've been huge changes in the homeless community in the last 2 years and this rest stop I think is among the most positive things that have ever happened for homeless people on the west coast." Eugene Police surrounded an illegal homeless camp known as Whoville Friday morning and told the 30 or so residents to pack up and go. 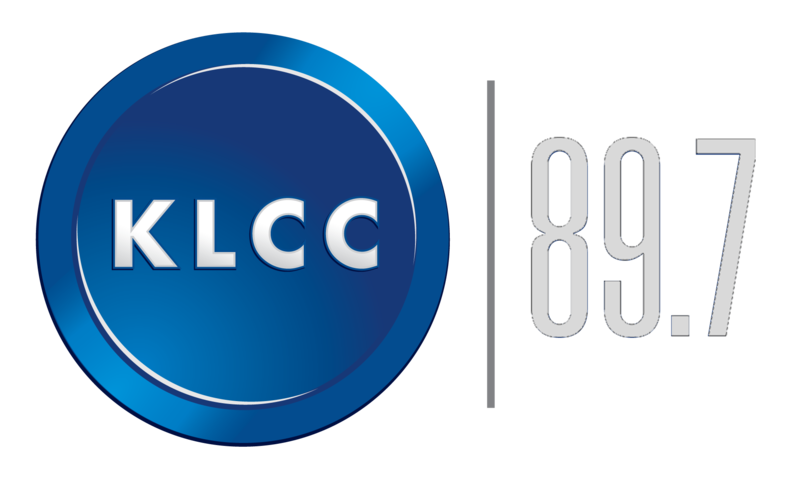 The City Council gave an April 15th deadline for the site to close. The Eugene City Council voted today [Wednesday] to withdraw a proposed rest-stop location for homeless people near the Science Factory and Cuthbert Amphitheater. 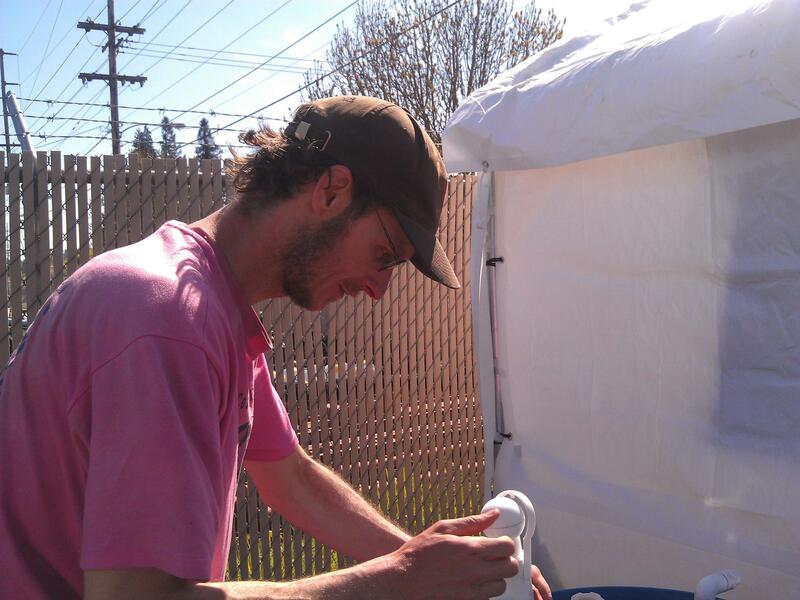 Last Friday, Eugene police shut down an illegal homeless camp near downtown called Whoville. City Councilor Chris Pryor made the move to withdraw the rest-stop because it's problematic for the Science Factory, Nearby Nature and a car-camping program. Councilor George Brown bemoaned the fact that Whoville was closed before another site was made available for its residents. The Eugene City Council voted Monday night to extend the pilot rest stop program, designed to provide the city’s homeless with temporary shelter on city-owned property.